In many jurisdictions throughout the world, local governments have a primary responsibility for the provision of public play spaces. Land use planning, budgets, tendering for design and build, inclusiveness, staffing, maintenance and safety as well as public engagement are among the key considerations that you as elected officials and civil servants assess when making decisions on public play spaces for kids. 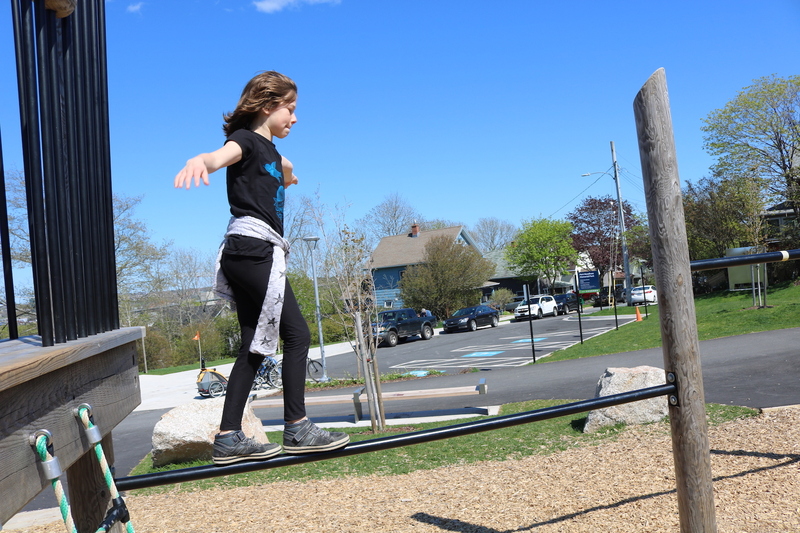 Two themes that continue to surface in the current play context focus on risk and on a broader range of play opportunities for kids in public spaces. They are frequently intertwined. In higher income countries, discussions are taking place on these topics with professionals from a variety of backgrounds including health promotion, injury prevention, childhood development, playwork, recreation, physical literacy, landscape architecture and urban planning. Mainstream media – The Atlantic, Macleans, Le Monde, The Sydney Morning Herald and SBS – Dateline– are reporting on shifting societal attitudes linked to risk and play and rediscovering a play menu for public spaces that goes beyond the standardized, off the shelf fixed equipment. And of course, parents and caregivers have much to contribute to the conversation. There is a general softening of the ‘zero risk’ ethos. An indulgence in over-protection, characterized and sometimes caricatured as ‘helicopter parenting’ and ‘cotton wool culture’, is on the wane. Momentum is building and coalescing around a new understanding that sees risk as part and parcel of an organic play continuum. 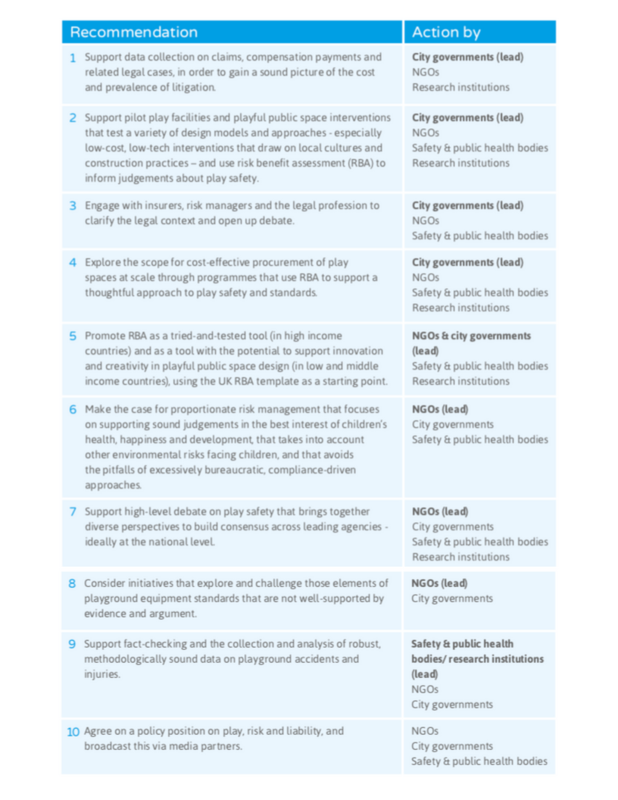 Two recent additions to the literature on risk and play provide evidence-based insights and perspectives that can help inform discussion and decision-making. The UK based charity, Pop-Up Adventure Play sponsored a research paper – Comparing Injury Rates on a Fixed Equipment Playground and an Adventure Playground (free download – 10 pages). This paper is authored by Pop-Up Adventure Play’s Morgan Leichter-Saxby and Jill Wood the Director of Adventure Play at The Parish School in Houston, Texas. Gill’s white paper is international in scope drawing on examples from high, middle and low income countries. Though relatively more robust in high income countries, information collected by local and national authorities on childhood injuries is uneven resulting in data and knowledge gaps. What is available however, demonstrates that childhood injuries related to playground activities are at the low incidence end of the spectrum. In Ontario, Canada for example, playground equipment related concussions were ranked in seventh place out of ten contributing factors behind soccer, baseball and cycling as well as contact sports and motor vehicle incidents. Gill concludes through a review of the literature that playgrounds are in fact “relatively safe places for children to spend time”. Nevertheless, there is still an imperative to manage risk responsibly. The paper continues by offering a pragmatic approach for understanding and evaluating what is at play. Namely, risk benefit assessment – “a risk management tool that brings together considerations about both risks and benefits in a single process.” An introduction and template for an ‘RBA’ is provided as Appendix 1. Clearly written and highly accessible, Gill’s work presents much more depth and nuance than are suggested in these few snippets. Spoiler alert, coming up below are the the recommendations from this excellent overview of risk and play (click to enlarge). For their part, Leichter-Saxby and Wood write about a very specific environment. 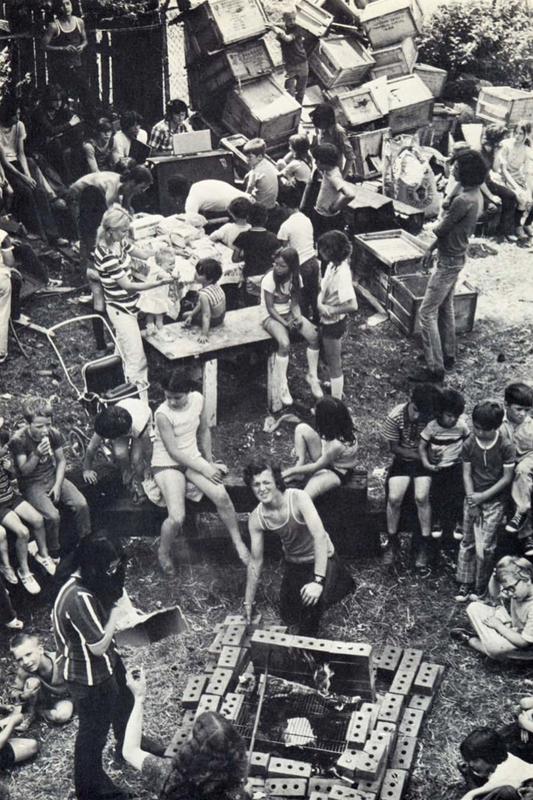 The Parish School in Houston, locale for the study, houses both an adventure playground and a standardized play space with fixed manufactured equipment. This tale of two playgrounds is ready made for a comparison of injuries recorded in two very distinct venues. 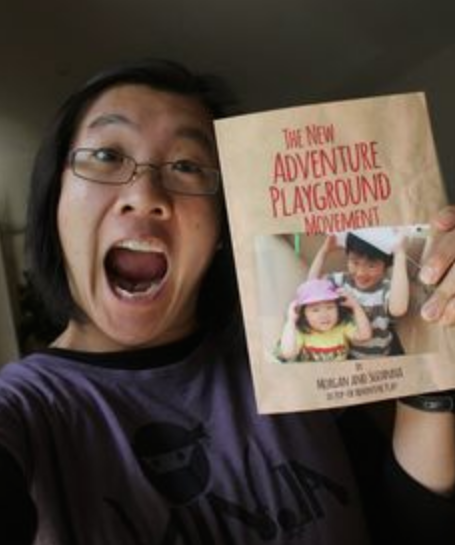 The writers acknowledge a bias to adventure play and the playwork tradition. The numbers however speak for themselves. Leichter-Saxby and Wood emphasize that both playgrounds present very low risk for injury. In a list of activities where rugby represents a high incidence of injury and snooker a low incidence, the Adventure Playground is just marginally above snooker and the fixed equipment just beyond that. 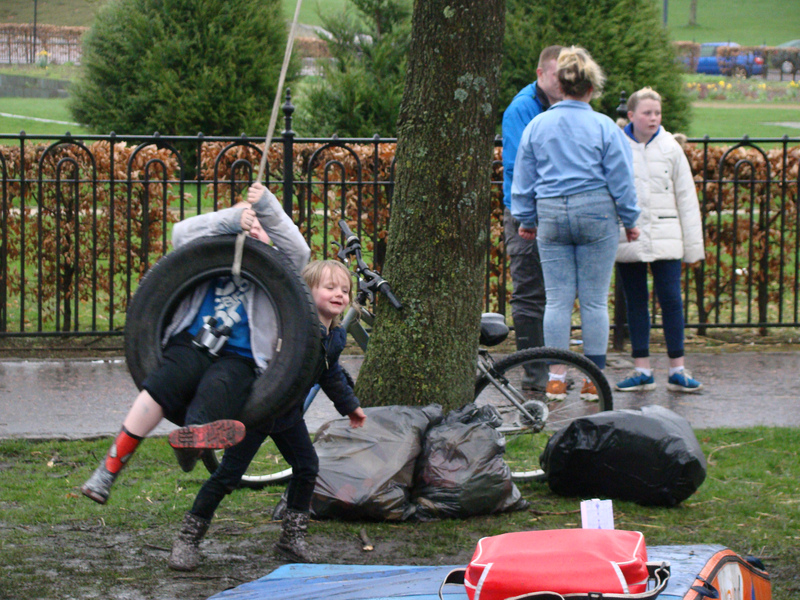 Over a five year period, the risk of injury was calculated at 0.00078% for the Adventure Playground and at 0.00336% for the fixed equipment play area. Reading the study’s conclusion we should anticipate more on this topic from Pop-Up Adventure Play. From this small sample, one can begin to question the assumption that playgrounds explicitly designed to remove risks lead to fewer injuries. One might investigate the other factors, such as the role of adults trained to understand play and risk. Or, it is possible that counterintuitively play equipment that is uneven, pointy, wobbly, irregular, and made by children themselves might cause children to act differently and thereby lead to fewer injuries. Playwork philosophy theorizes that both contribute. More study is required. Both studies are quick, easy reads that present invaluable information. As for a broader range of play opportunities in public spaces, we’re starting to experience that in Canada with firms like earthscape and space2place, with the proliferation of natural playgrounds and forest schools, all abilities playspaces and the growing popularity of loose parts play. 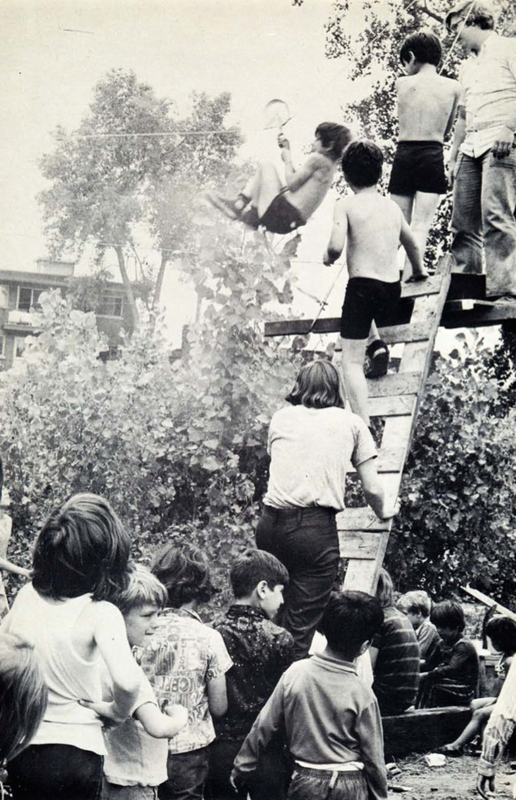 Next it will be time to resurrect the adventure playground defunct since the 1970s in Montreal, Toronto and Vancouver. They are sure to rise again, rumblings are already being heard, and afford kids an entirely different play experience. Bravo to all the local governments who are experimenting and extending themselves perhaps a little beyond their comfort zones in the name of play. The kids are loving you for your actions. For kids, play is not an outcome based pursuit. It is spontaneous and without any specific purpose beyond play itself. As adults we all have a responsibility to help children experience the joy of play. Let’s embrace risk and resilience and support the renaissance of play. 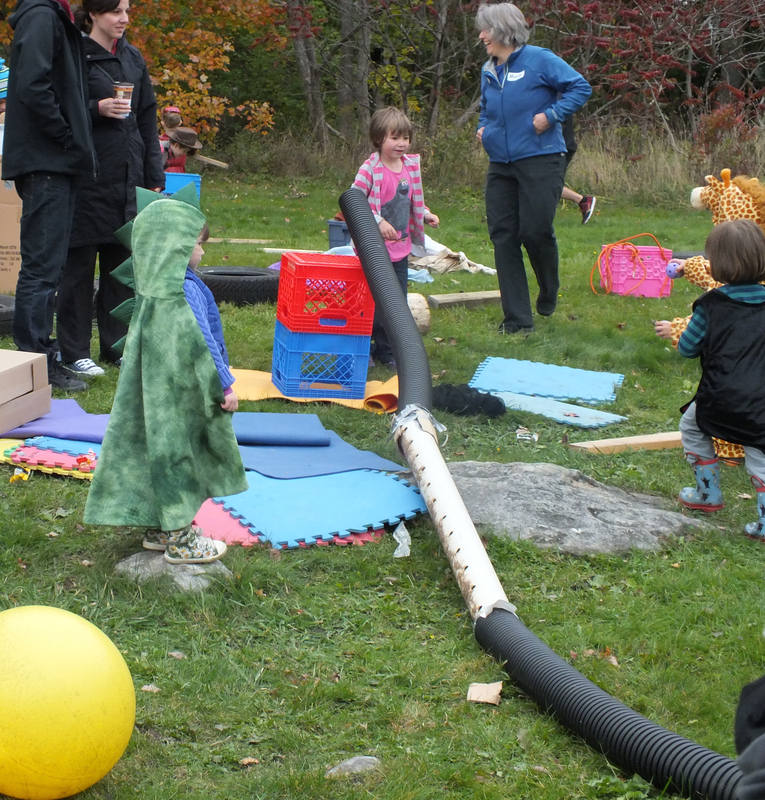 Ed’s note – I worked with the Pop-Up Adventure Play team including Morgan Leichter-Saxby as well as with Tim Gill during their respective 2017 and 2015 public engagements in Halifax, home of PlayGroundology. From May 31 to June 3, Canada’s national association for municipal government, the Federation of Canadian Municipalities (FCM) is holding its Annual Conference in Halifax. Hopefully some of the delegates will have the opportunity to speak to play and visit some of the city’s newer play offerings. Over the years, PlayGroundology has received lots of wonderful comments from readers and play enthusiasts around the world. It is a real pleasure to think that in some small ways the blog is helping to inspire people to advocate for a greater variety of public play spaces for kids. Today, a comment arrived from Hong Kong regarding a post published in 2012. I lived near this park. I was born in 1969, the same year as this park opened. These sculptures accompanied me since I was born, until I was 16. They were then too old and replaced by new playground facilities. The most fascinating thing about this playground is that it was composed of 4 different sand pools. Kids built sand castles there everyday. Besides, those sculptures possessed secret holes and spaces where kids could play hide and seek. A kid could hide himself inside a sculpture so secretly that no one could discover him within 10 minutes. Amazed? Every night, lovers would hide themselves inside those “holes”, kissing each other and ……….. These park brought me a marvelous childhood, wonderful memory!!!!!! An article was published earlier today in Hong Kong about this playground from the past. I don’t read, or speak Chinese but for those who do, the article is reproduced below with some lovely photos. Damon Leung kindly provided the English translation which follows the original HK01 article. Last Sunday, the visitors of the West Kowloon Cultural District would see dozens of photographs and their detailed explanations along the railings of the waterfront. It was a part of the community art program “Kwai Chung Festival”. Organization (MaD), together with the neighbours of Kwai Tsing, showcased the community cultures of Kwai Chung and Tsing Yi in the West Kowloon in various creative ways. The setup consisted of Kwai Tsing historical photos was designed and developed by the art planner Fan Lokbi and her colleagues. During the exhibition everyone was amazed on four photos as she expected. 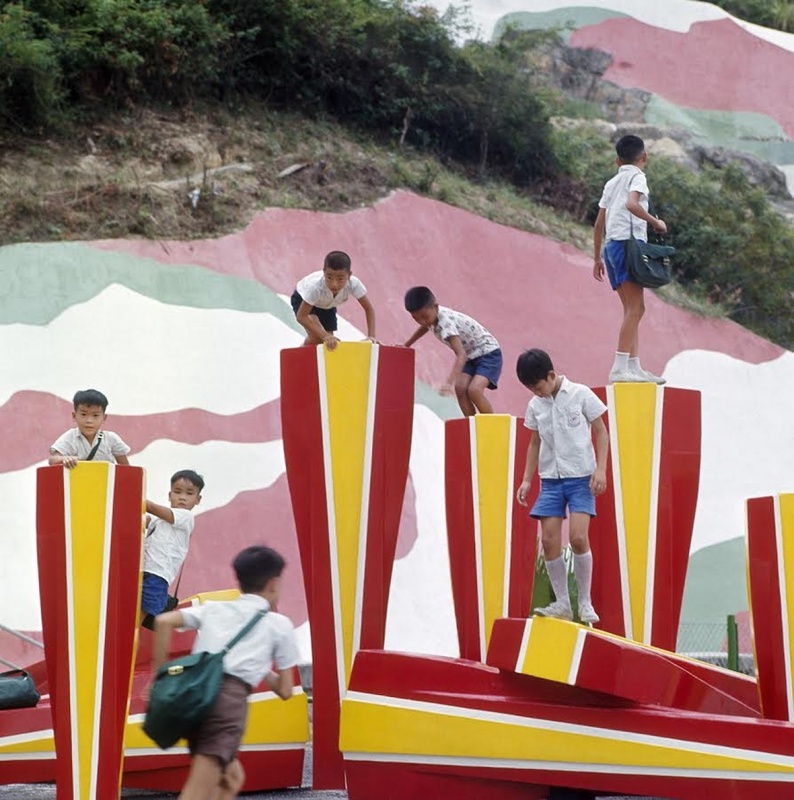 They showed that Kwai Chung had a very avant-garde playground 50 years ago and everything started with the discovery of these few photos. How the unknown avant-garde playground was discovered? “Kwai Chung Festival” was a program organized by District Councils and MaD jointly. Fan Lokbi remembered that during a meeting with district counselors, she was informed that there had been a Wah Tak Studio in Kwai Chung before. So when she was looking for historical pictures of Kwai Tsing District, she would pay special attention to whether there was any trace of Wah Tak Studio and later she got an unexpected reward. She went to the Image Library of the Information Office to check the color photos in the annual reports. “I had turned over each year until I turned to 1969, I saw six exotic playground photos. They were so colorful. I was shocked by one of the playground photo. The Wah Tak Studio, I have long been looking for, was shown at the lower right corner of that photo. That meaned the colorful playground was located in Kwai Chung. Fan Lokbi, who was engaged in the art, met this unfamous playground along the path of Kwai Tsing to Wah Tak Studio, and to the Hong Kong annual report. Familiar with Kwai Chung geography and architectures, she found no information about the playground on the Internet after a little search. She knew that this might be a big discovery. Facilities can not be classified as slides or swings but more like sculptures. A few photos brought a clue about an importnt page in the art histories of Hong Kong and its amusement area. Everyone is complaining about the playground facilities getting backwards today. However, in addition to the old styles of playgrounds shown in the nostalgic discussion groups, Hong Kong amusement area in fact have had a very different page before. 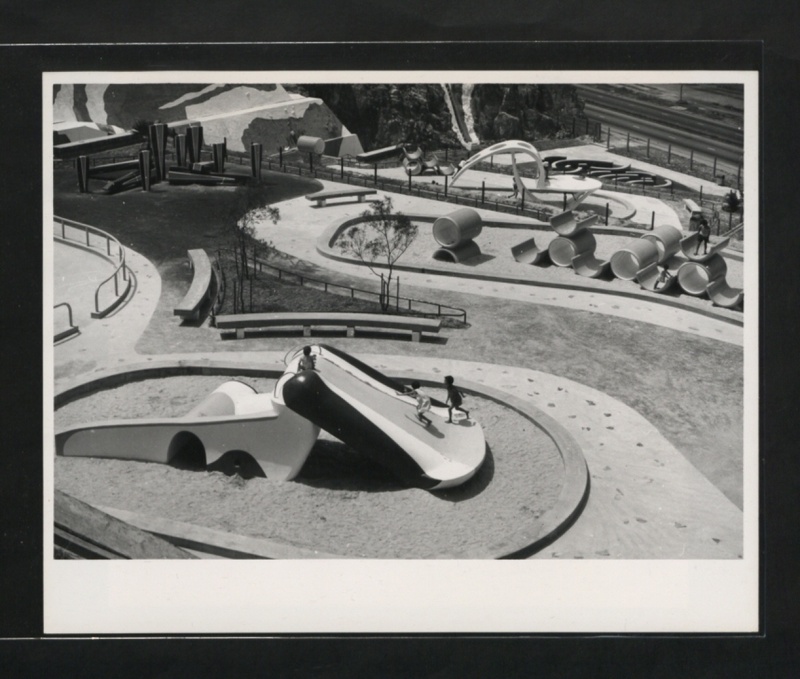 Photos showed the playground, of which the four large-scale recreational facilities were difficult to classify as slide or swing. They were more like large modern sculptures, abstract, simple, just like surrealist works. Some were even like postmodern designs. In addition to the rare sculpture design, the hillside behind the playground also was treated as a canvas and painted with simple abstract drawings. The layout of this “sculpture playground” was clearly full of artistic ideas. Its designer, who was enthusiastic about art education and had worked in Hong Kong, was an American artist. Fan Lokbi pointed out, “The only text explanation of the photo mentioned that it is located in the Shek Lei resettlement estate. 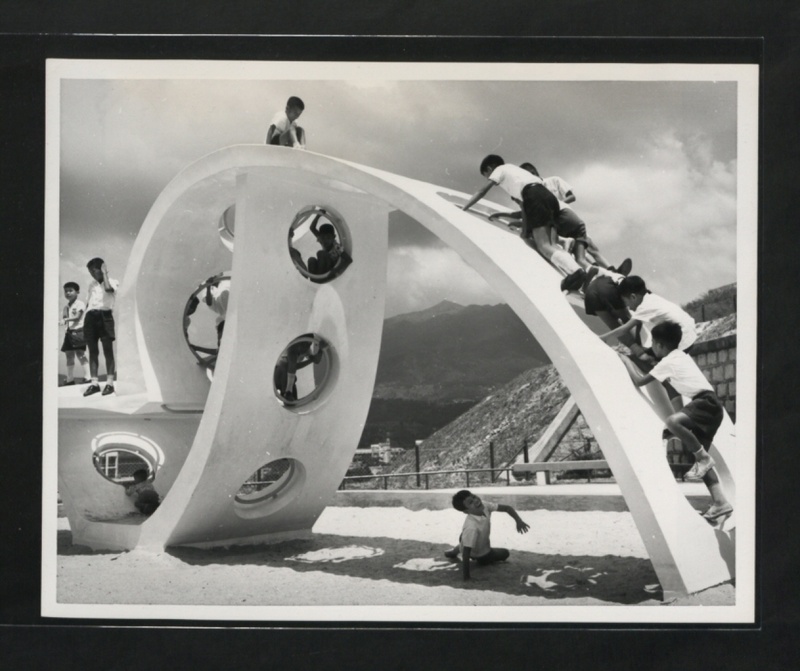 Built in 1969, this type of playground was the only one in Asia made by American artist Paul Selinger. At that time the Royal HK Jockey Club donated HK$150,000 to build it. Online information about the playground is probably the same as these.” The information on the annual report also showed that Paul Selinger regarded Hong Kong as the first stop and hoped that this unprecedented playground would keep appearing in other places. He also hoped that the construction could be viewed as sculpture works and also be a new type of facilities to let people amaze. Designed by American Artist, “Artistic Freedom” was given by Hong Kong to realize his ideas. “In the online and community history, almost no information about it. 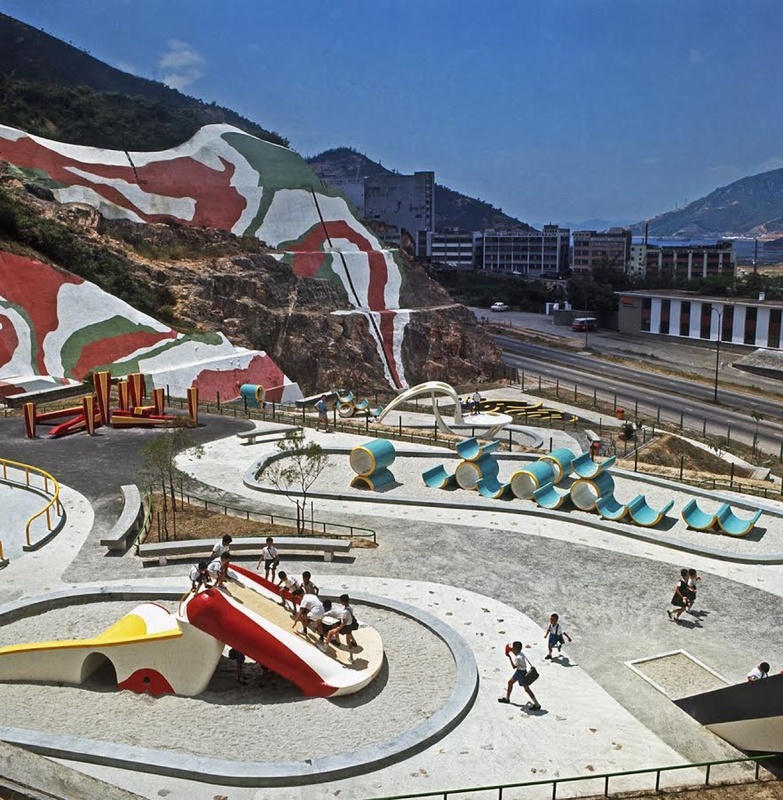 In fact Hong Kong had such an avant-garde playground, which synchronized the trend of Europe and the United States at that moment.” Fan Lokbi found that the world’s famous blog Playgroundology, which studied the playground design as a new social science, had talked about this park on its website. 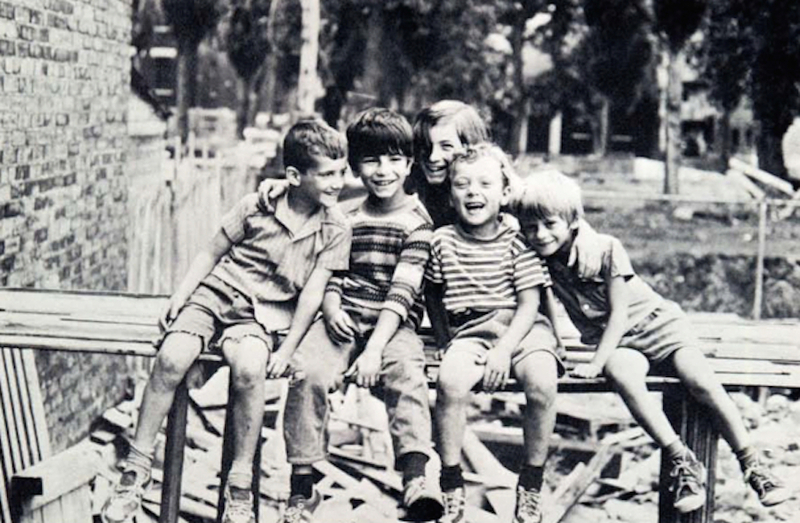 Playgroundology encountered related information in the United Kingdom national archives. From the information its location was known as “colonial Kowloon”. Playgroundology received even less information than Fan Lokbi, so no study followed of course. Knowing Playgroundology asked for more relevant information, she shared the information found accidentally with their experts. Hong Kong playground as a new page of the global post-war building trend. The only information showed that Paul Selinger, who died at the end of 2015, taught art at the University of Hong Kong since 1961. 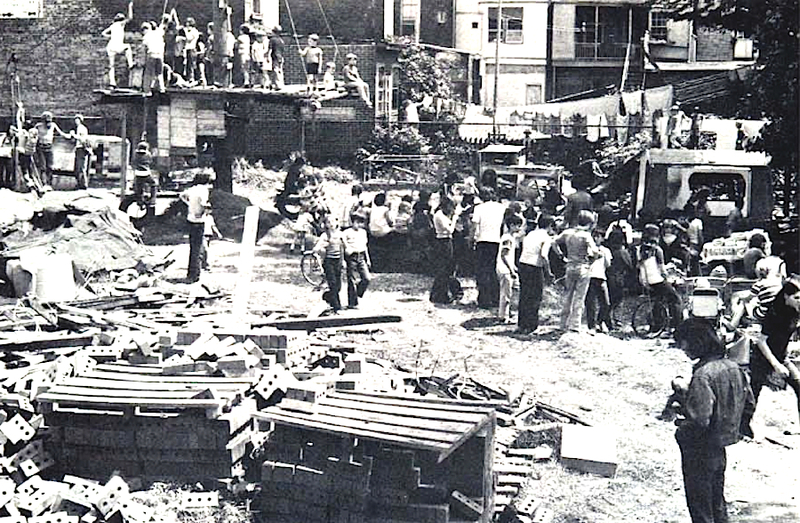 Soon after the concept of the avant-garde playground was implemented, he returned to the United States in 1969. Searching for the playground information today, in addition to the pursuit of such a “miracle” Hong Kong had before, the city was lamented for the avant-garde space nearly 50 years ago which was no longer there today. Not only as initiatives to build more creative public playgrounds, but also to reproduce a small piece of puzzle in the history of the world’s modern playgrounds. After the Second World War, innovative young students and artists in Europe and the United States were actively engaged in public utilities for the people and contributed to a large number of avant-garde and whimsical designs. These designs were implemented in public buildings, especially in the design of public housing, public spaces and public facilities. The playground was a particularly experimental page. 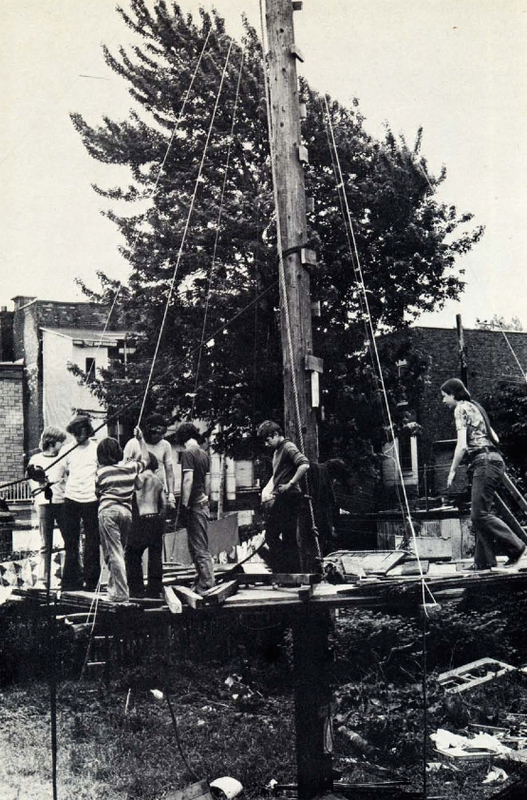 Many “rugged” pioneer playgrounds came into being, so far were still fascinating the world. 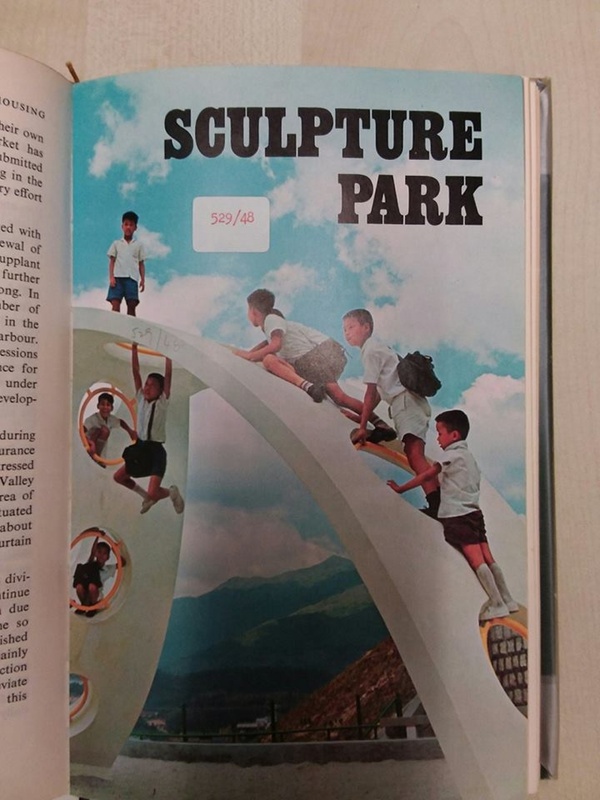 But it was unexpected that a Hong Kong’s resettlement estate would use abstract sculptures as the theme and had connected to the history of avant-garde playground since 1969. There’s a great play event coming to Southern California from February 16 through 19, 2017. Don’t dream about it, escape from grey sky winter days and experience a new adventure playground in development. This ‘campference’ is brought to you by the globe trotting good folks at Pop-Up Adventure Play and Val Verde’s Santa Clarita Adventure Play who will be welcoming participants to Eureka Villa. The Campference will headline Professor Fraser Brown, Head of Playwork at Leeds Beckett University’s School of Health & Community Studies, Erin Davis, Director of the documentary The Land, and Jill Wood, founder of “AP” adventure playground in Houston, Texas. Campference programming will also include a variety of hands on workshops, keynote Q&As, a screening of The Land, discussions and activities surrounding playwork theory and practice with National and International playworkers, and more. Pop­-Up Adventure Play was founded in 2010 by Suzanna Law and Morgan Leichter­Saxby and aims to help make a children’s right to play a reality in every neighborhood by disseminating playwork principles to a range of audiences. Operating primarily in the US and UK, they provide long­ distance and in ­person support to play advocates in seventeen countries and recently completed a world lecture tour. Santa Clarita Valley Adventure Play was founded by Jeremiah Dockray and Erica Larsen­Dockray in 2014 after Jeremiah began the playwork course. 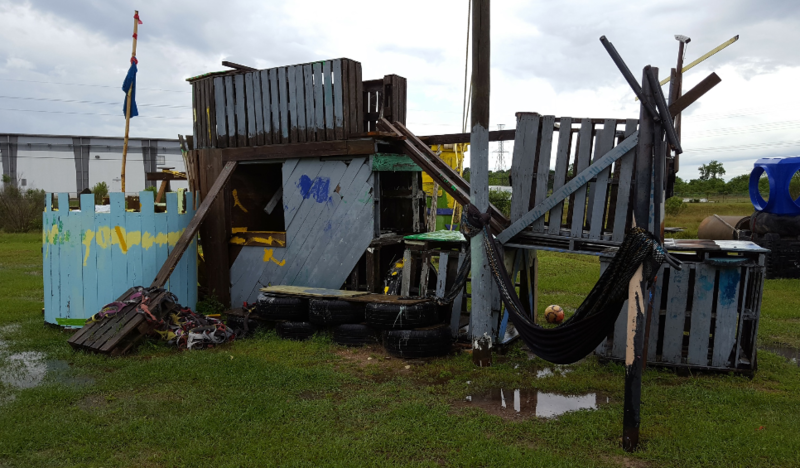 While working on a course assignment he came across an abandoned 2 acre park which is now the developing home of Eureka Villa Adventure Playground. It will be the only adventure playground in Los Angeles County. Get your tent, sleeping bag and campfire stories ready for a Santa Clarita Valley Adventure this February. Early bird discount registration closes October 2. Last chance to register is January 16. Registration details here. co-published, with Australian friends Playground Ideas, Loose Parts Manual. You can get your free copy here. PS – remember to bring marshmallows…..
Ed’s note – I’m a fan of Glasgow-based City of Play. I’m a sucker for cable spools and other playcycled materials. Though I’m born and bred in Canada, my roots are from Scotland’s west coast. Having had the good fortune to visit and stay with family on several occasions as a young boy, I have a soft spot for the places along the River Clyde where my parents both grew up. When I heard that City of Play co-founder Grant Menzies was off on a bit of a play research jaunt, I asked him if he would like to guest post here at PlayGroundology. Here he is for your reading pleasure. Woeste Westen really seems like a crossover space to me where nature play meets adventure playground. More on Grant following the post. 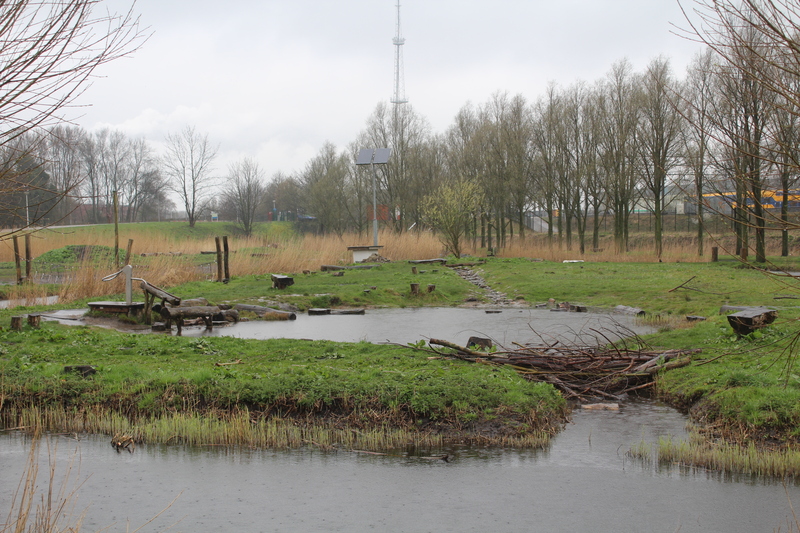 Woeste Westen is an exceptional natural ‘playscape’ a short bike journey west of Amsterdam City Centre. 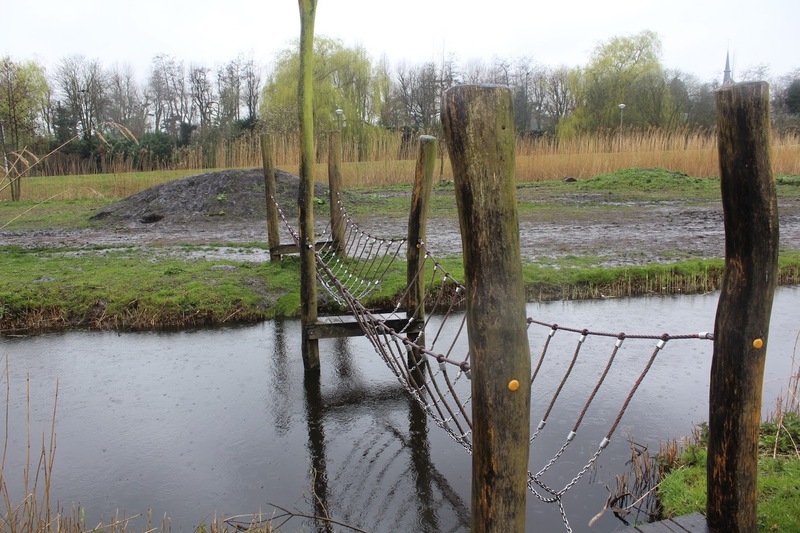 Natural playgrounds are not uncommon in the country however this is one of the few that has the psychical presence of an organisation to support it. Considering the country’s unique geography it is perhaps unsurprising that water features quite heavily in park. To be honest, it’s the main feature. The site was once harvested for peat leaving a series of manmade waterways which have been bridged, dammed, pumped and… eh… rafted? That is, there is a water pump and a raft. There are also any number or den building, climbing and balancing opportunities; bonfire sites; and animal habitats both natural and man made… /child made. 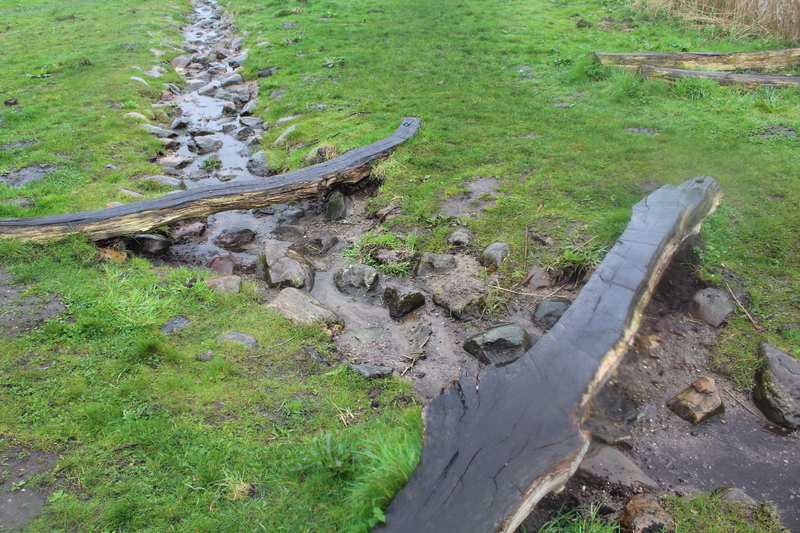 This amazing (and it is amazing, look at the pictures) natural playscape is supported by the weekly run Adventure Club and onsite clubhouse/ parents cafe. 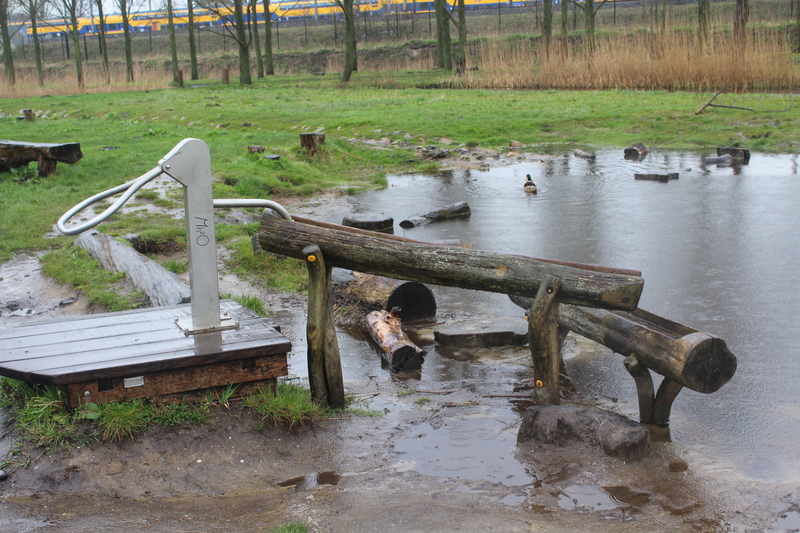 Woeste Westen is a truly inclusive landscape offering challenges and opportunities for all ages and abilities. A series of crossing points present different challenges to span the water with varying degrees of difficulty. Rope bridges, felled trees, wobbly bridges, rafts, stepping stones and shallows ensure that the body and mind are continually tested without being forced to encounter unmanageable risks. This is a land and waterscape to invite and excite all. 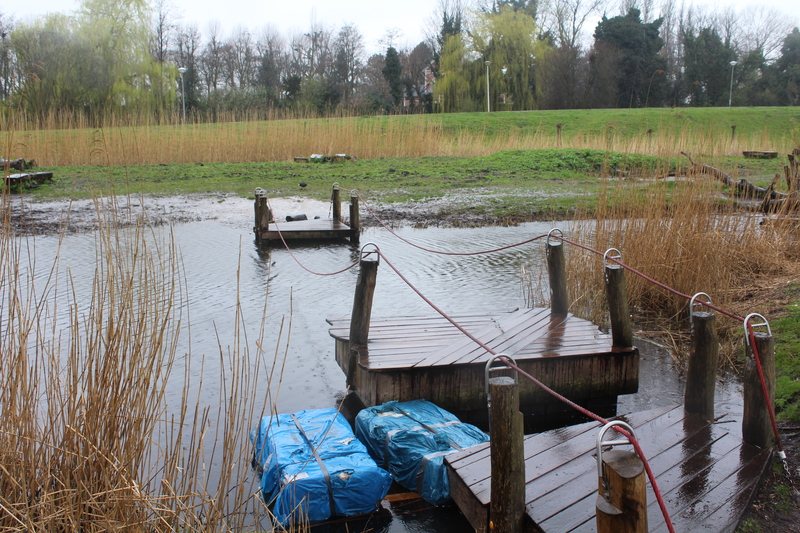 The abundance of water and wildlife not only provides play value but is a soothing and calming influence. Although chaotic, Woeste Westen is peaceful and pleasant in a manner rarely achieved through other designed “Nature” playgrounds. Our arrival coincided with the rain. We witnessed the Adventure Club dress in waterproofs building fires and making popcorn showing that this is an all weather experience. 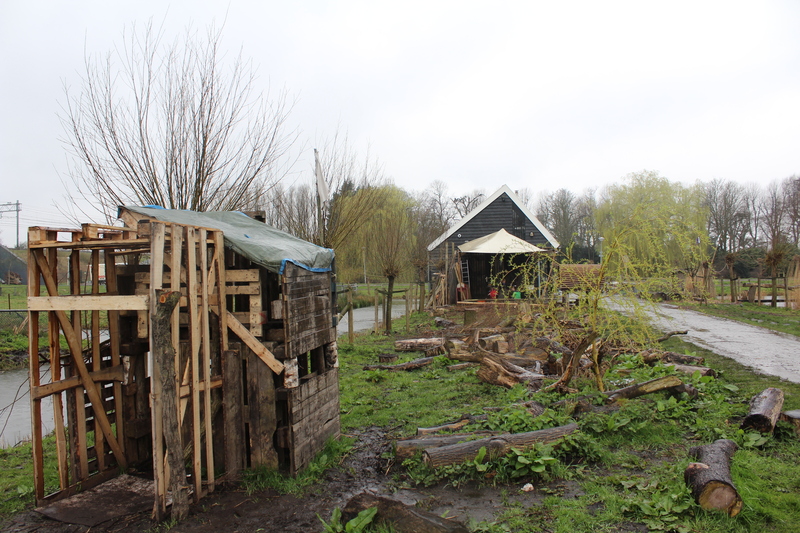 At Woeste Westen we met founder Martin Hup a former biology and environmental education teacher. Martin discovered this publicly owned piece of land around 8 years ago not much different from what it is now, as a playground with the raft and bridges, but it was rarely used. Although only a few minutes from the bustling city it was still in the middle of nowhere; children/families had no need to pass by and therefore it was not used. Still he insists he is not a play worker, he/they programme events and are ‘facilitators’. The playground, although now fenced, is still public property but without their presence – running the Adventure Club and serving “fine coffee” – no one would use it. Concerned, if not dismayed, by reports of schools in the Netherlands removing skipping ropes and balls from pupils due to parent complaints of injury, Martin and the Adventure Club warn that they actively seek risks in their sessions. Many new parents and even children visiting the park show the same nerves we commonly see in our risk averse time; many concerned by how often their child might climb a tree – God forbid they should get a scratch or a bruise! In Woeste Westen you may well break a leg… But *shrugs* “so what?”. Although it might surprise you to learn that with 57,000 visits per year they still haven’t had any serious injuries. Martin describes that when children visit, despite initial reservations, they are somewhat set free. They can run and explore and experience the joy of discovering nature for themselves but also they experience a certain ‘Je ne sais quoi ‘ – in a rare moment of broken English described as like “touching their inner Neanderthal” they are wild again. Grant gained his Masters Degree in Advanced Architectural Design from the University of Strathclyde in Nov 2012. Inspired by the birth of his first daughter, Grant’s thesis focused around the needs and rights of children in urban design. Subsequently, Grant developed an understanding of, and passion for, play and ensuring its proper and right provision. Grant also spent a semester studying Landscape design under Henry WA Hanson at the Czech Technical University in Prague. Having funded his time while at University working in the building services Grant has an interest and skill at making, fixing and up-cycling as can be seen in works such as The Twits Chairs. 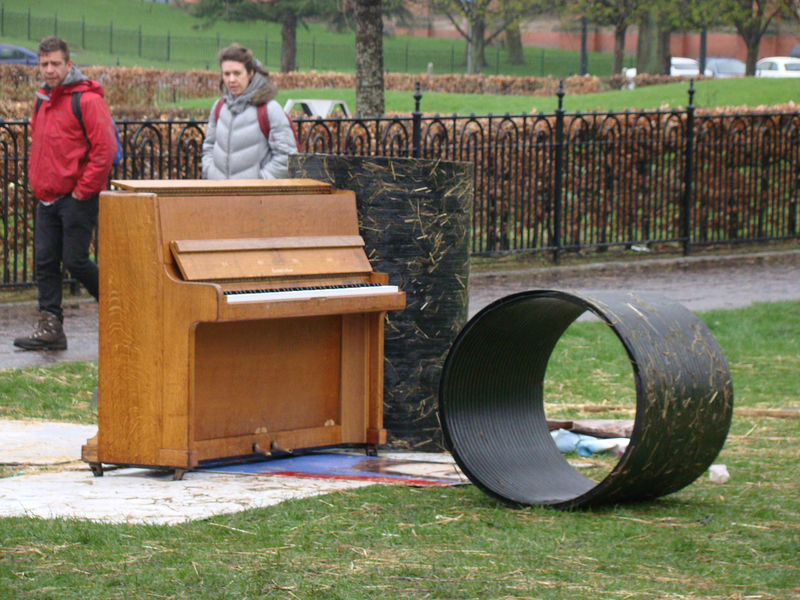 Loose parts play in public spaces is not yet commonplace in Halifax, Canada, PlayGroundology‘s home turf. When public play happenings, starring kid encounters with the bric à brac of ropes, tires, fabric, boxes, etc., do occur they’re awash in magical aha! moments at a somewhat more accelerated rate than in places where this form of play is more on the map. Most kids here have never seen anything of the like, a conglomeration of matériels gathered with the express purpose of fueling child-led play. 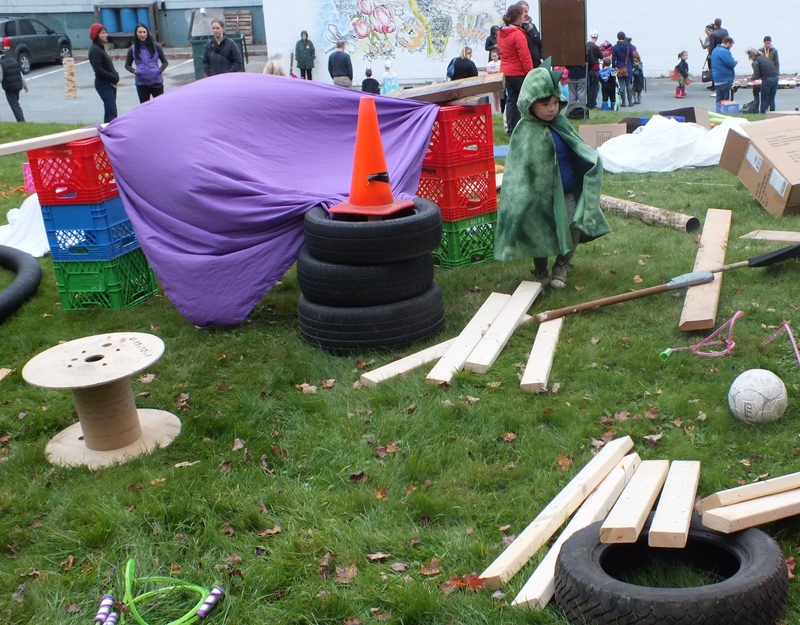 First contact moments – when kids meet loose parts play – run a range of reactions: bemusement, tentativeness, to full throttled exuberant exploration. My evidence-based experience in this topsy-turvy, quasi-anarchic world is still squarely in the neophyte range and is more anecdotal in nature rooted as it is in personal observations and shared commentary. What does seem prevalent though is that kids, even those older ones who are developing a veneer of studied cynicism, are quickly shifting into gear and embracing an engaged abandon in landscapes of their own making. The luminosity of loose parts kids is striking. Their intent is intense and light at the same time. Their inner space reaches out to the outer place refashioning it with laughter and ideas and anything else at hand. The simplicity calls out for experimentation, for daring, for kidcentricity. There is a charge coursing through the air. Kids who don’t know each other are playing together and moving beyond individual age groups. Cooperative play is de rigueur even though no adults have requested, or suggested it. Kids are testing their own limits taking risks they are comfortable with. On the periphery, parents are witness to a new play dynamic. Some say they will get loose parts for home use. Loose parts spoke to the kids making a visceral connection. The kids in turn spoke back with their animated faces, their inventiveness, their thirst to make and build, their luminosity. In their actions with no prescribed outcomes and a touch of independence they embody a phenomenology of play. As I continue to participate with others in making loose parts play events available in public spaces, I will be paying more attention to documenting ‘first contact’ through photos and video. There is a lot of rich material there just waiting to be tapped. In the interim, here are a few loose parts resources, listed alphabetically, for those looking for some ideas and inspiration. I’m hoping to play the loose parts tunes for quite some time. 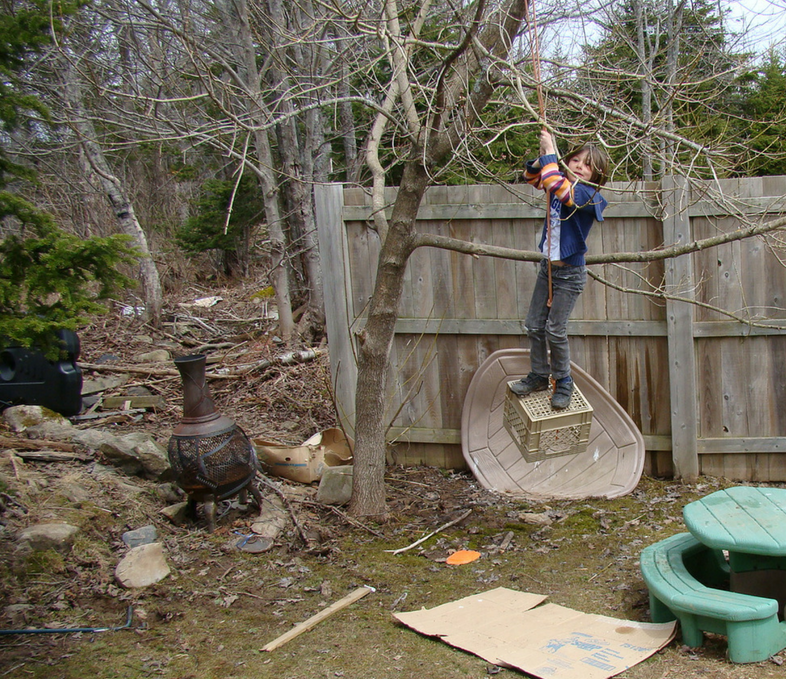 We’d love to hear about your loose parts play….. Thanks to Heidi and the Morning Live crew for profiling play on the show. If you tuned into the segment today and are interested in more background or resources, here are a couple of places to start. Click on the image, or all CAPS title to take you to Storify content. Talking about risk and play, here are a few resources. More PlayGroundology content on Storify here. 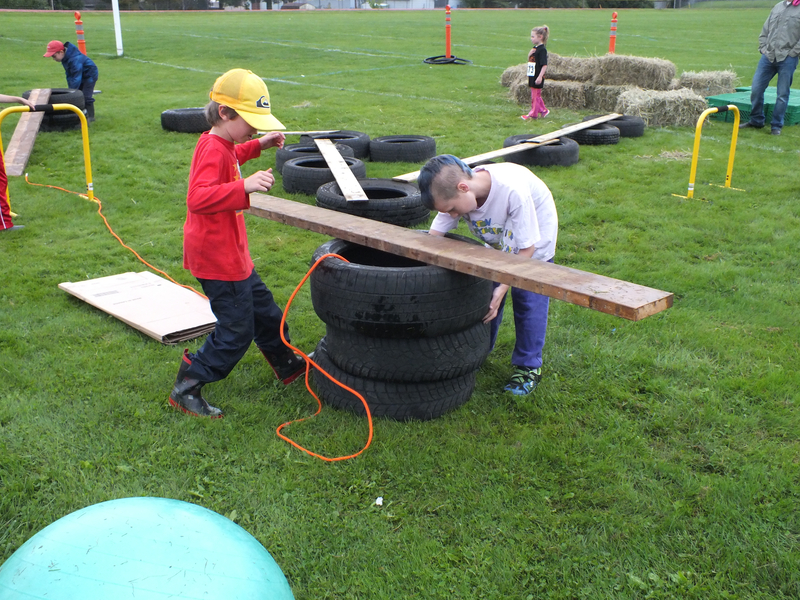 Check Adventure PlayGround YHZ for adventure play info and upcoming events. 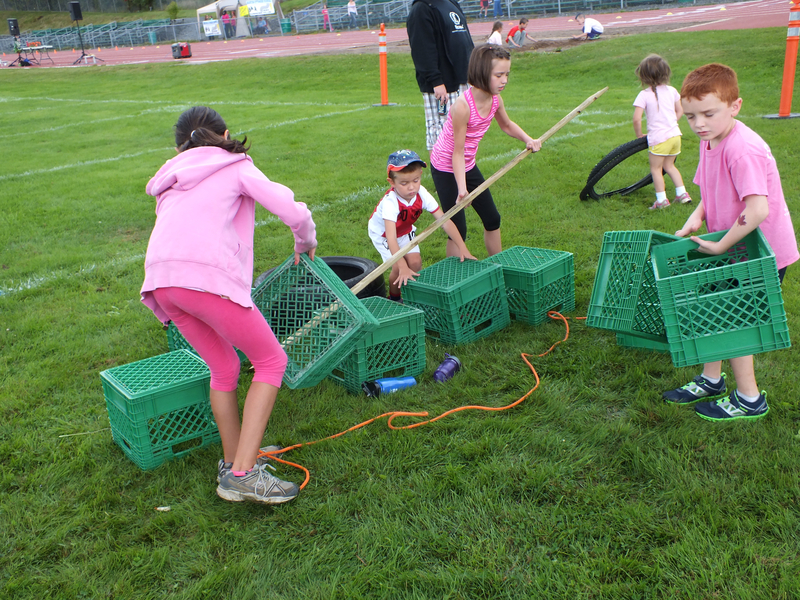 Stay tuned for details on loose parts play on the October 24 weekend in Halifax. 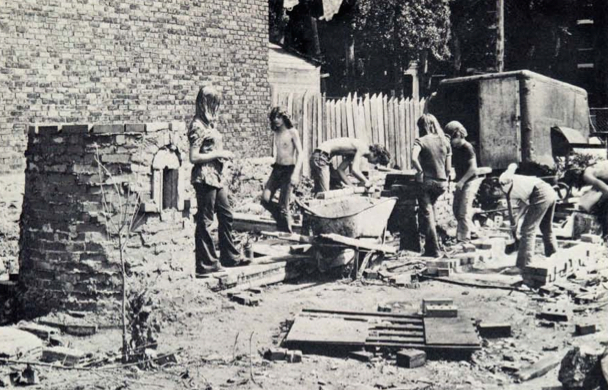 In the summer of 1972, Opportunities for Youth, a Canadian federal government program, enabled 18 young people to work on two playgrounds. Located on vacant lots in Pointe-St-Charles, these play spaces were inspired by Europe’s adventure playgrounds. There had never been anything quite like them in Montréal before or since. The projects were under the overall direction of McGill University School of Architecture students, Pieter Sijpkes and Joe Carter who encouraged counsellors to take their cues from the kids. This is a partial list of what the neighbourhood kids got up to that summer taken from the project report – Opportunities for Youth – Perspective Jeunesse: Adventure Playgrounds – Green Thumbs, Sore Thumbs (a good read with plenty of images). 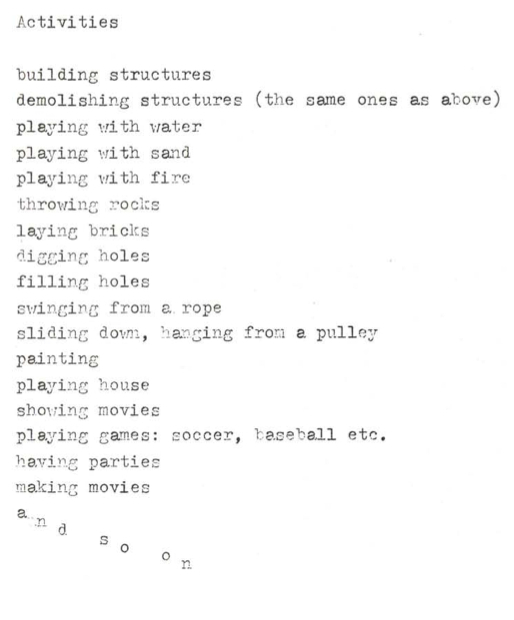 These activities fall squarely within the adventure playground canon and photos in the report (some reproduced here) show kids building, creating, experimenting – having the time of their lives. The playgrounds were not runaway best sellers right out of the gate. Prior to and during the project itself, there was limited opportunity to engage with community parents and elders. For the first month, kids were not beating a path to either one of the playgrounds. Parties became the saving grace. They got the the kids flockin’ and the spaces rockin’. Forty years later, there are no adventure playgrounds in Canada to my knowledge. Readers please correct me if I’m wrong. 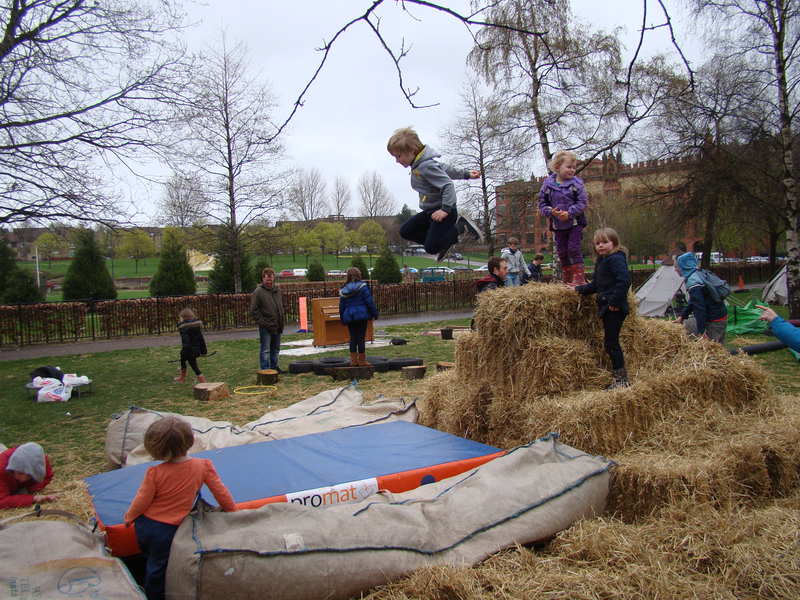 In the UK, Germany, Scandinavia and Australia, they continue to be important kid spaces – fun fueled community assets – though some are facing funding squeezes from local authorities. In the US, a few adventure playgrounds, such as the one located in Berkeley, California, are still in operation. Currently, there is a resurgence of interest in adventure playgrounds in the US related partially to discussions around risk and play. This interest has been reflected in the media through articles like Hanna Rosin’s The Overprotected Kid in The Atlantic and Erin Davis’ new documentary film, The Land that explores play, risk and hazard at an adventure playground in Plas Madoc, Wales. Isn’t it time that our children had this much fun, learned self-reliance, experienced risk and embraced lasting friendships based on the adventure of play? Are there any adventurous neighbourhoods, or communities in Canada stepping up and embracing the adventure? I would love to hear news of any adventure playground type activity already underway, being developed, or contemplated. 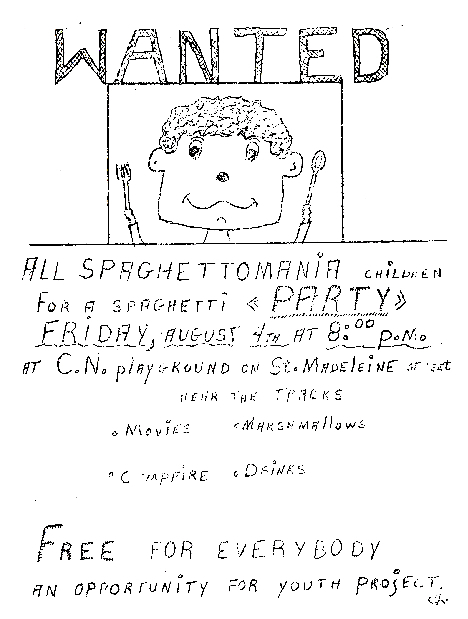 Many thanks to Pieter Sijpkes who got back in touch with me when I contacted him after reading a story in the Montreal Gazette that referenced his 1972, Pointe-St-Charles Summer of Play. Sijpkes and Carter’s willingness to try something new sure helped make a lot of kids happy. Here is part of what Pieter Sijpkes wrote to me in his reply. Across the decades, at internet velocity perhaps this Pointe-St-Charles story will help to inspire new adventure playground stirrings in Canada.